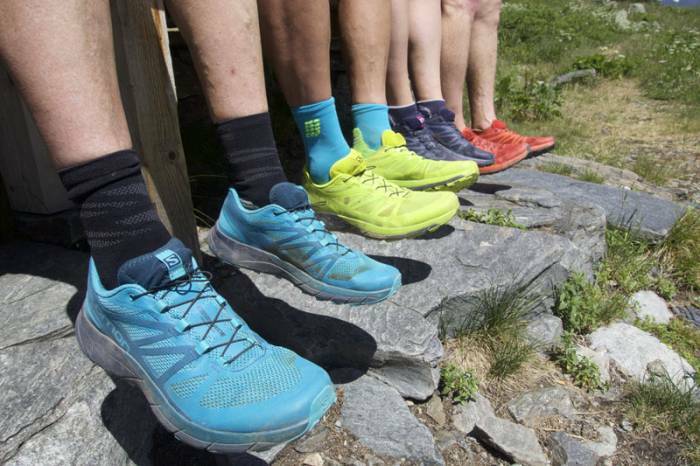 “Which running shoes should I buy?” As a gear tester who runs regularly and tests dozens of pairs per year, I get asked this often. 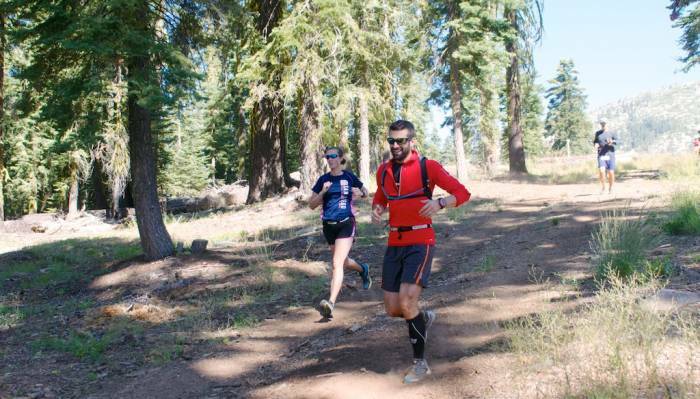 Here’s my advice for choosing the best trail running shoe for you, without the BS. More than any other equipment in the outdoors, running shoes are an extremely personal choice. A shoe loved by one may be loathed by another. And with so many options, it can be hard to know where to begin. Here are some guidelines and ways to make shoe buying easier. Having just finished the Leadville 100, I ran in a lot of shoes this summer. My co-editor Nate also ran a ton, peaking at The Rut. 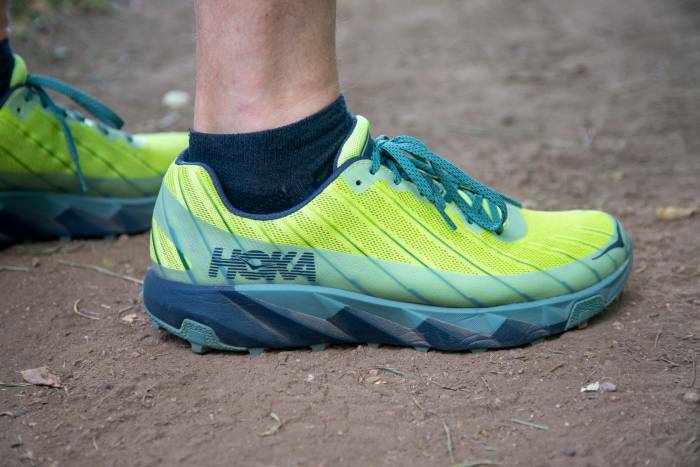 Hop to the end to see some of our favorite trail running shoes on the market now. This is the most important thing you can do when buying running shoes. Everyone’s feet are different, and the only way to know if they really fit is to get them on. If you can’t try on many shoes, at least read as many reviews as possible from various sources. With this in mind, if you find a shoe you really love and have used for significant miles, consider buying a couple pairs up front. Brands are under constant pressure to evolve, so the shoe you fell in love with this season may not be around the next. Buying online? Double-check the return policy and consider ordering the two pairs closest to your size with the plan to return one. Before buying shoes, ask yourself one question: “What will I actually use these for?” If you dream of running a 100-miler one day, but realistically will use the shoes for 5-mile training loops around your local park, buy shoes for the latter usage first. The “stack height,” or amount of material under your feet, is one of the fundamental differences between shoes. Some people think less material is good, resulting in a more natural feel that leads to good biomechanics (minimal shoes). Others think thicker, more protective shoes lead to fewer injuries and more comfortable running. Even after tons of research, there’s no conclusive answer to which style is better, so do some homework and decide how much cushioning you’d like. It will help narrow your field dramatically. If you do decide to run in minimal shoes, be sure to start gradually, with short runs, and build up very slowly to help avoid injury. For most trail running, you don’t want a waterproof shoe. Waterproofing can be great for hiking, but for running, your feet will sweat too much for a waterproof membrane to keep up. Obvious exceptions include really muddy or snowy trails at ultra lengths, and possibly cold, wet weather. Generally though, stick with highly breathable shoes. 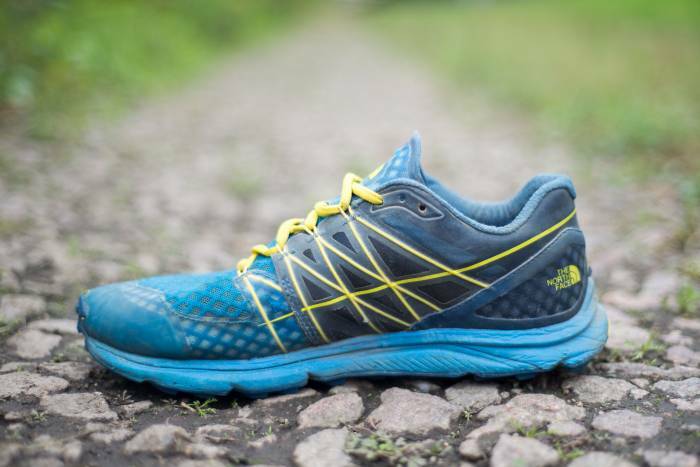 Compared with road running shoes, trail runners will want grippy soles to navigate the slick, uneven, rocky, and muddy terrain. Look carefully at the trails you plan to run. If they’re mostly covered with stones and hard dirt, a short lug pattern will be great. Those who run on lots of muddy or soft surfaces should look to a deeper lug pattern to gain purchase. 6. Foam or Rock Plate? 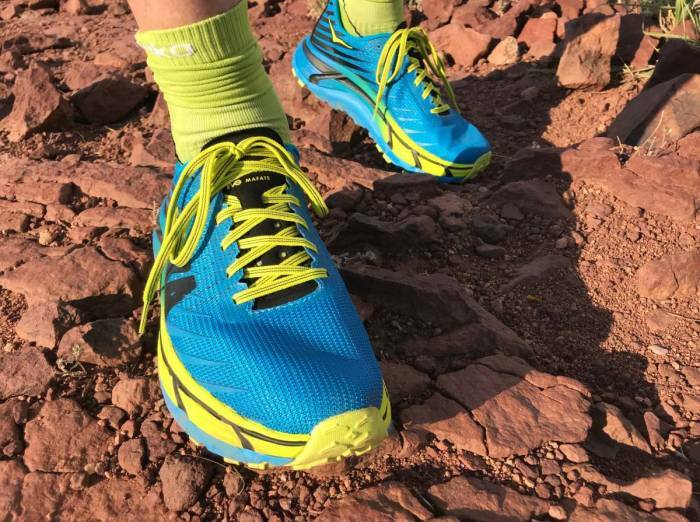 If you run over rocky terrain, you may want a shoe that helps protect your foot from hard edges. Two schools of engineering are thick foam or rock plates (thin, hard plastic plates in the shoe). Both have good and bad points, but generally, foam absorbs more shock while plates provide a more natural feel of the ground and precise foot placement. Some shoes are designed with a wide forefoot. 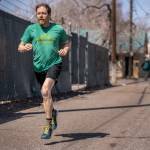 For folks with wide feet, or those running very long distances, a wide forefoot can be a bonus that lets toes splay. The downside is that wider shoes are less precise and can be a little more clumsy, and won’t fit well on people with narrow feet. Running shoes should be as light as possible while still offering the protection you desire. Anything over about 12 ounces for a men’s size 9 (the weight of the super-plush HOKA ONE ONE Stinson) is just too heavy. Lighter is better if possible. Fit: A thumb’s width of empty space at toe, with snug heel and mid-foot. Some space around forefoot can be good. Wear shoes for as long as possible before buying. Any small annoyance felt in the shop will be magnified dramatically miles down the trail. Drop: How many millimeters drop from heel to toe? Depending on running form and preference, you may want anywhere from a flat 0mm drop to 12mm or more. Investigate this before shopping. Tongue: Does it fit comfortably? Will it keep rocks out of your shoe? 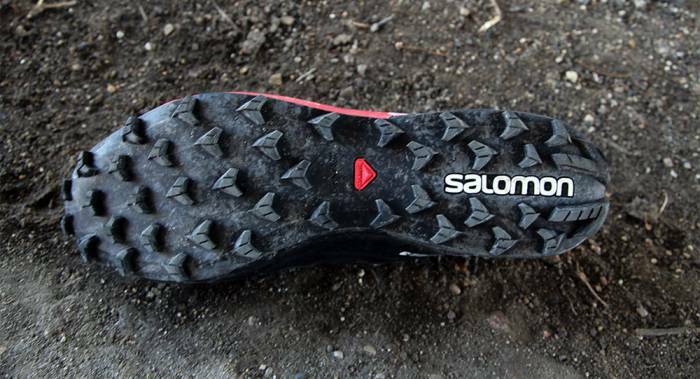 Outsole: Choose big lugs for soft soil and mud, small lugs for hard soil and rock. Weight: The lighter, the better. We consider 12 ounces the maximum for a men’s size 9. Price: More expensive doesn’t mean better. Judge the shoe by its attributes, not its price. I ran a lot of miles this summer, mostly on rocky, steep trails near Denver, in preparation for the Leadville 100 Trail Run. I finished in 28:36:51. These are the shoes that made it possible. This is currently my favorite shoe for big distance. The EVO Mafate is a well-cushioned trail shoe that provides pretty good proprioception. I wore it for about 70 out of 100 miles at Leadville. It has great traction and kept my feet happy for a very long ride. Read my full review here. It’s one of my favorite trail running shoes of 2018. The Torrent also played a big role in Leadville for me. I used it in the more technical portion of the race over Hope Pass. The Torrent is a lighter shoe with a 4mm heel-to-toe drop and a very aggressive outsole. I loved this shoe for moderately technical terrain where you still want decent foot protection but with more precise placements. Check out our first look review here. The Altra Lone Peak carried me through most of my first 100-mile race. And the updated version available now was one of my main training shoes for the Leadville 100. I love the wider footprint that lets toes splay, especially on long back-to-back training days. The zero-drop platform is also great for my training, as it works my calves more than shoes with more drop. It was one of my main training shoes for runs up to about 15 miles and on days when my feet were sore or tired from previous runs. This is another fairly precise shoe that works great on tricky terrain. I use this one a lot on training runs in rocky, rugged terrain. I really like the speed lace system, and the upper hugs the foot without causing hot spots. It takes cues from higher-end race shoes at an affordable price. With that in mind, it’s not super cushioned. I usually use it for runs up to about 10 miles and not much longer. The North Face Ultra Vertical is a simple shoe, and that’s what I love about it. There aren’t any visual-based gimmicks or experimental features that could distract the runner. What it does — cushion, comfort, durability, weight — it does very well. The shoe is very precise and allowed me to run fast down steep and loose alpine talus. That’s a tough task for any shoe. And the fit, combined with soft upper, was so exceptional I didn’t mind wearing them for over eight hours. I wore the North Face Ultra Vertical during trail runs before, during, and after the 2017 Rut 50K. So there you have it. Those are my favorite models right now. I’ll update this down the road as shoes evolve. Now run out there and get to work!